Are you planning the next big party event in your calendar? It could be your wedding, an office party or even that big birthday you never want to mentioned in public without a visit to your plastic surgeon first. Whatever the event, you will surely be thinking about the dance floor and what you could do to make it bring your event to life. As any party planner knows, the dance floor can make or break a party, for one thing, it is usually the centre peice of any event set up. Unlike ten years ago you can now do pretty much what you like with your dance floor. So we have selected 5 unique dance floor designs to help you make your decision. Ranging from the classic Oak Parquet wooden floor through to the bespoke branded circular. Get rid of all those harsh square edges and chose a circular floor. These are a great choice of dance floor because they aren't seen that often and are not very well known. The only downside of course is they cost a bit more to hire, but the result will be worth it. You can also add a bespoke pattern or logo on top. Perfect for a wedding or coporate bash, you can literally brand your dance floor. You may have a fantastic lighting rig set up from the ceiling, but have you thought of combining this with an LED Dance Floor. Covered in tiny pin spot led lights these floors come in all shapes and sizes as well as a multitude of colour combinations. These floor can also be set up to dance in time to your music. By far the best effect is when the lights are dimmed and you let the dance floor do the talking. Fancy something a little more flashy, then look no further than the mirrored dance floor. Increase the size of your event by magically transforming the dance floor into a giant mirror which reflects all of the surrounding lights. We can create this effect in a multitude of colours depending on the theme of your event or party. Check out the one above, covered in a gold mirror. Needless to say the mirror gets a little bit scratched once used, but as far as glamour goes, there is no better way to make guests gasp when they enter the room. A sure fire way to impress your guests is with a freshly polished Black and White dance floor. Adding a classical element to any party and perfect for those Alice in Wonderland themed events. The likeness to a giant chess board is not lost on your guests and will make them think of you as the intellectual you always thought you were. Think John Travolta for this one. Take your guests back to the 70s with a unique LED Disco Floor straight out of the movies. The lights are programmed to react to the music, so make sure you have a great DJ to get people up and dancing on this special dance floor. It takes longer than the average floor to set up and therefore can be more expensive but when you see the results you will be glad you went the extra mile. We hope this helps you to make a decision for your next event or party. We may have ended up confusing you, but bear in mind as the holders of the largest dance floor selection in the UK we come to your aid. 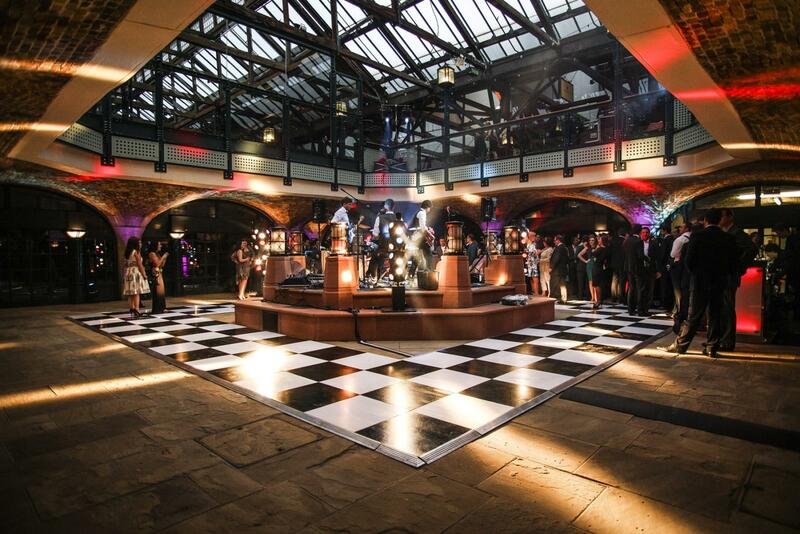 At Albert Hall Dance Floors we take pride in delivering specialist and bespoke Dance Floors around the UK. With a warehouse in Battersea we have unrivalled access to the centre of London, so please bear us in mind for your next event. Use the contact form provided to get a quotation for your next Dance Floor Hire.